The lights went out in the lane for nine rivals as the 3-year-old City by the Bay ($11.20) unleashed a strong closing kick in her debut against older rivals as she won the $58,225 Harvest Stakes at the Big Fresno Fair by 5 1/2 lengths Saturday. Unbeaten in her first three starts, including a pair of stakes, City by the Bay ran seventh in the Bet America Oaks at Pleasanton on June 22, three weeks after winning a stakes race at Emerald Downs after an 8 1/2-month layoff. "It was frustrating. 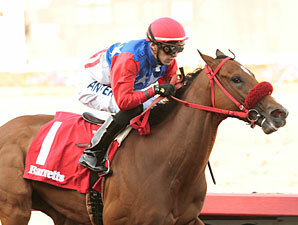 I felt bad for the filly," said trainer Billy Morey. "At the time, we thought it was the right spot." Morey freshened the filly and began pointing to the Harvest more than two months ago. City by the Bay sat behind Unforgettable U, who just had won her debut at Los Alamitos, through fractions of 22.38 seconds, 44.89. City by the Bay was moving better on the turn as she rallied three wide into the stretch. Once the field turned for home, the race was over as jockey Juan Hernandez pushed clear and kept the City Zip filly going to the wire as she increased her margin over the longshot Hidethegoodstuff. Fast-finishing Macha was third, another half-length back, edging the favored Unusual Way by a nose. City by the Bay, a $40,000 2-year-old purchase by Martin Bach and Jack Owens, had a series of strong works heading into the race, including a pair of six-furlong bullet drills to conclude preparations. "She's pretty fast when she's racing or working," said Morey. "Those were big works, but we needed them to prepare for this." The victory, worth $33,350, was her fourth win and third stakes victory. She now has earned $131,175 with four wins in five starts. 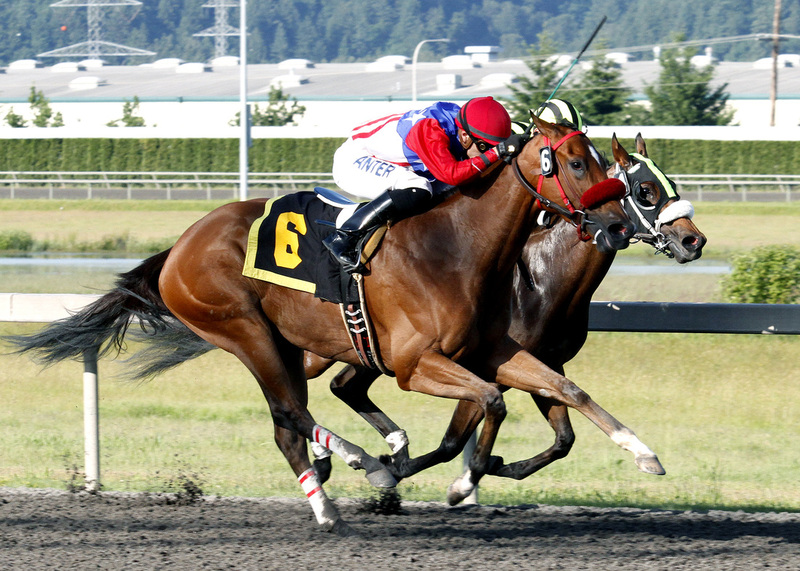 AUBURN, Wash. (June 1) – California shipper City by the Bay remained undefeated Sunday with a brisk three-quarter-length victory over a stubborn Chu and You in the $50,000 Seattle Handicap for 3-year-old fillies at Emerald Downs. Ridden by Juan Hernandez at 119 lbs, City by the Bay ran 6 ½ furlongs in 1:14.76 and paid $3.60, $2.60 and $2.10. 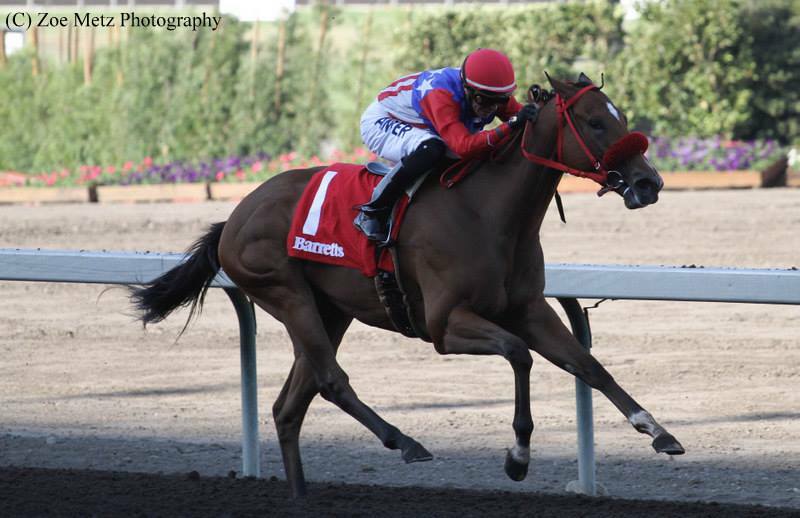 The winner, who was making her first start since an 8 ¾-length victory in the $100,000 Barretts Debutante last September, is trained by Billy Morey for Martin Bach of Danville, Calif. and Jack Owens of Modesto, Calif.
Now 3-for-3 lifetime, City by the Bay earned $27,500 to push her bankroll to $97,670. Based at Golden Gate Fields, the Kentucky-bred daughter of City Zip has notched wins at Santa Rosa, Fairplex Park and Emerald Downs. Pomona, Calif. (Sept. 14, 2013) – Shortly after the start of the 24th edition of the $100,000 Barretts Debutante on Saturday, the race was effectively over. That’s because the 6-5 favorite City by the Bay, ridden perfectly by jockey Juan Hernandez, broke cleanly from her rail post in the 6 1⁄2 furlong sprint. Briefly headed in the first quarter mile by Side Letter, City by the Bay had a two length lead down the backstretch through early fractions of 21.55 and 45.91. Hernandez asked the daughter of City Zip for her best on the far turn and she responded, opening up a commanding 8 length advantage into the stretch. At the wire City by the Bay was 8 3⁄4 lengths in front of 24-1 longshot Harlington’s Rose, who had rallied from ninth, with Perched another 1 3⁄4 lengths behind in third as the timer blinked 1:17.94 for the distance. The Barretts Debutante is a race for 2-year-old fillies and restricted to horses that went through one of the Barretts sales auction. Purchased for $40,000, City by the Bay is unbeaten in two starts and banked $55,000 for her Debutante victory. She paid $4.60, $3.60 and $3.